The Bible Code. The DaVinci Code. Did God really encode hidden messages in the Bible? Yes! 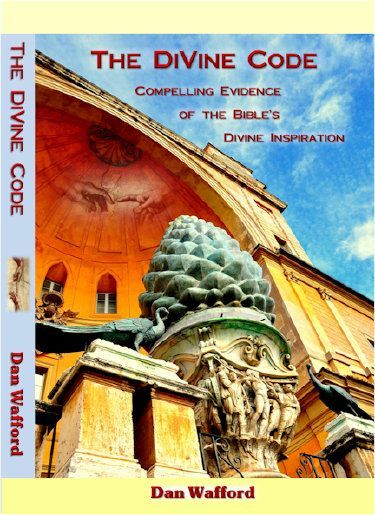 But unlike the uncertain Bible Code or fictional DaVinci Code, God's code reflects the clear text message of His plan for man and the seven works of grace that Christ performed on man's behalf. What is this message that God has encoded within the Scriptures? The message is nothing less than God’s complete plan for restoration of fallen man to his proper place at God’s side. The world’s greatest treasure map. You are HERE. God is THERE: X marks the spot. Here is the route you must take to get from HERE to THERE. A very important message, indeed! So just why did God conceal it within types and symbols? Well, He did and He didn’t. The reason we can know we have interpreted the encoded message correctly is because it repeats in every detail, in the same critical sequence, the steps on the path to God that is explained openly in the Bible text. Is this duplication really necessary? It is a characteristic of man that somehow, visual images impart information on a different level and in a different way than spoken or written facts. God could have simply told Pharaoh, “There will be seven years of plenty, followed by a terrible famine of seven years.” How much more impact did the message have when it was told as a visual story? Seven fat cows eaten by seven emaciated cows who nevertheless remained emaciated. God could have simply told Nebuchadnezzar, “There will be five kingdoms with diverse characteristics.” How much more memorable is the image of a great figure with a head of gold, breast and arms of silver, torso and thighs of bronze, legs of iron, and feet of mixed iron and clay? Similarly, God has given us a clear written description of His plan for man, and to reinforce that message, He has repeated it in the form of visual symbols that will communicate to our minds more vividly in a different manner. The pattern is consistent: God gave Pharaoh the dream, then Joseph the interpretation. He gave Nebuchadnezzar the dream, then Daniel the interpretation. God hid his plan for man in the Hebrew Scriptures – the Old Testament – in types and symbols. Then He sent Christ and the apostles to teach the message openly, as recorded in the New Testament. Understanding of the symbolic message will reinforce understanding of the written message, and it will also undergird faith: only God could have hidden a complex message in the Scriptures so cleverly, and then revealed it so clearly. When Adam and Eve disobeyed God, they placed themselves and all of their descendants into a state of alienation from God that He had never intended. This state of alienation from God is defined by the Bible as spiritual death. But God in His love and mercy formulated a plan to restore fallen man to spiritual life and full fellowship with Him. God’s plan of restoration for fallen man consists of seven works of grace accomplished by Christ. Contrary to the teaching of other religions and even many Christian teachers, man’s role in this plan is generally passive: his journey to restored fellowship with God is not accomplished through his own efforts or sacrifices, but rather by recognizing and accepting the seven works that Christ does on his behalf. Man’s ultimate destiny is to be restored to the presence and fellowship of God. He will begin this phase by transformation into an eternal spirit being. Christ will perform two additional works for man to complete his restoration. In His sixth work, He will appoint man to dominion over a kingdom, exalting him to share His and the Father’s throne in heaven. And in the seventh, He and the Father will provide man eternal Sabbath rest. God has miraculously ordered these accounts, such that the account of the first day of creation has encoded within it elements of a divine message about the first of Christ’s works on behalf of fallen man. The accounts of the first event of the exodus, the first furnishing of the tabernacle and the first feast also have encoded within them additional information about the first of Christ’s works on behalf of fallen man.